When it comes to home decor, is there anything more lovely than a bouquet of fresh flowers in the room? 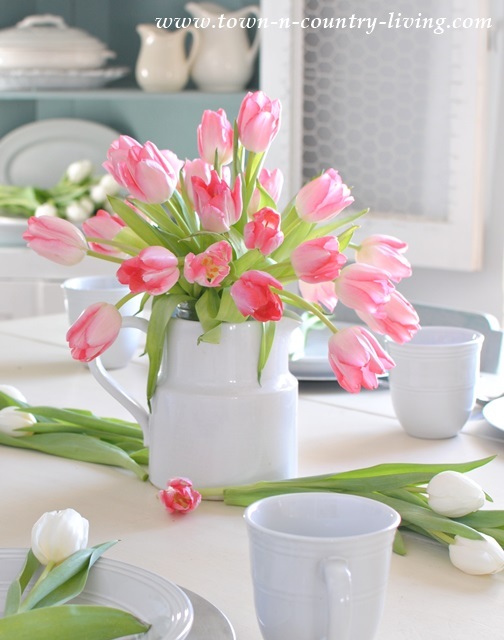 And what could be sweeter than an easy tulip arrangement that spills over the sides of its container? As luck would have it, I recently spied several bunches of tulips in the store that were calling my name. I don’t recall ever seeing tulips for sale this early in the winter and had to have them. 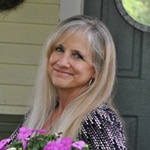 My love of flowers is credited to 3 people in my youth … my grandmother who grew fabulous mums and roses, my mother who always filled her garden spaces with floral color, and Mrs. W across the street who had me babysit her 3 children on Saturday mornings. Mrs. W also happened to be the local funeral director’s wife so I figured she knew a thing or two about flower arrangements. 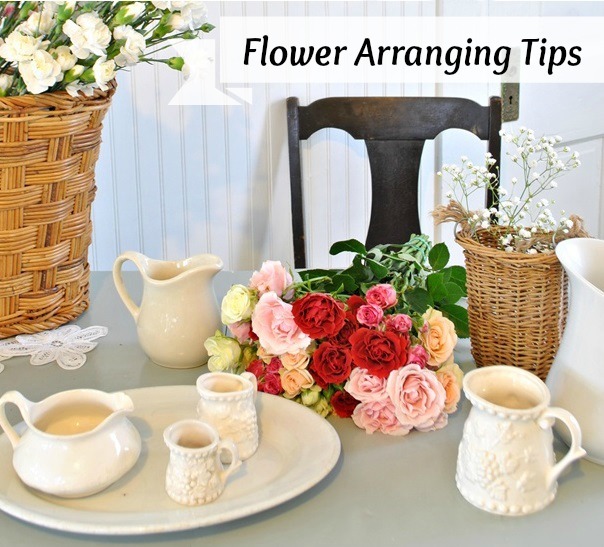 Every Saturday she brought home a bouquet of fresh flowers and placed them on her dining table. 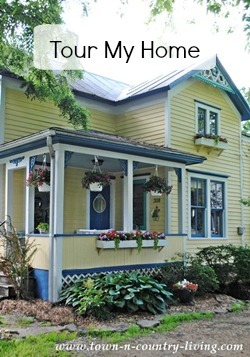 Then and there I vowed to have fresh flowers in my home as often as possible. So whenever I feel guilty for buying flowers, I remind myself of my childhood oath. 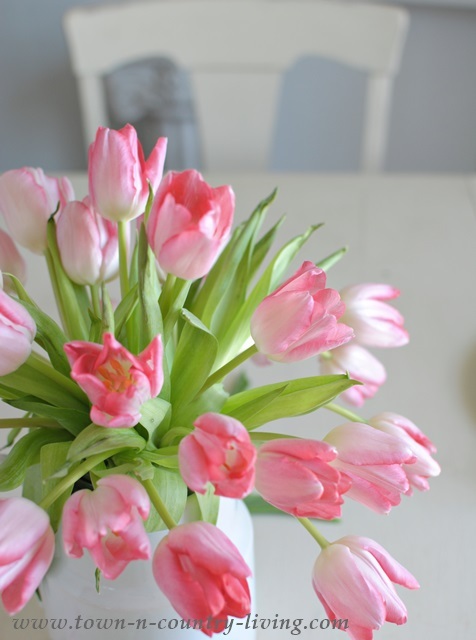 Besides … tulips aren’t that expensive and they’re oh so pretty! 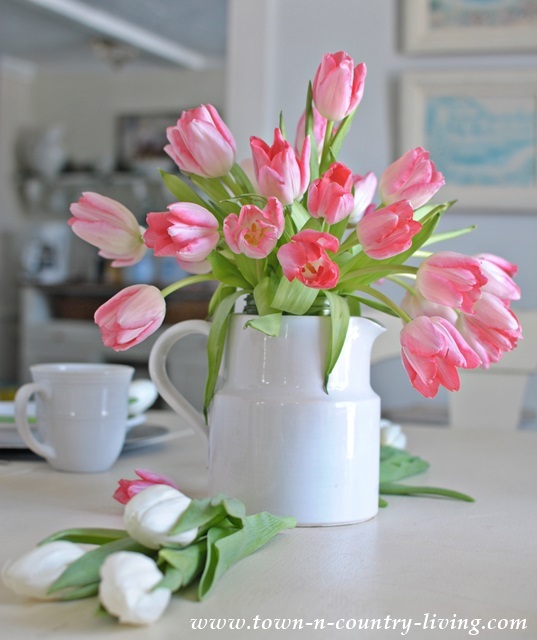 An easy tulip arrangement idea is to simply place them in a pitcher or vase with no other adornment. 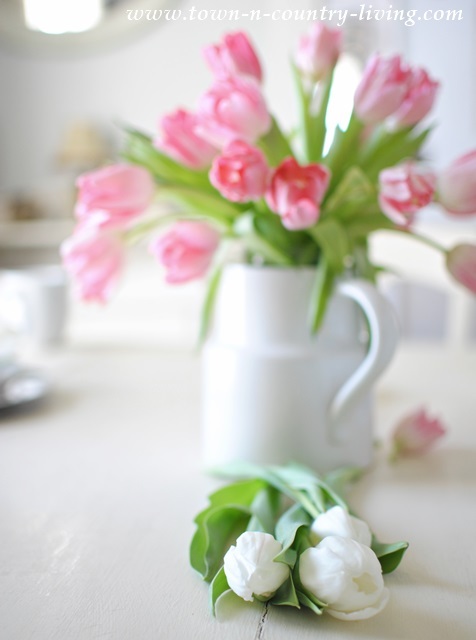 Tulips hold a simplistic beauty and can stand alone without a fussy floral arrangement. 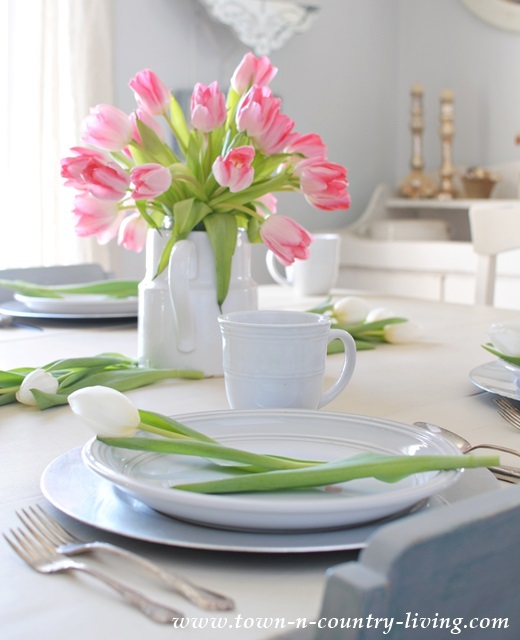 Might as well let some tulips spill out onto the rest of the table! 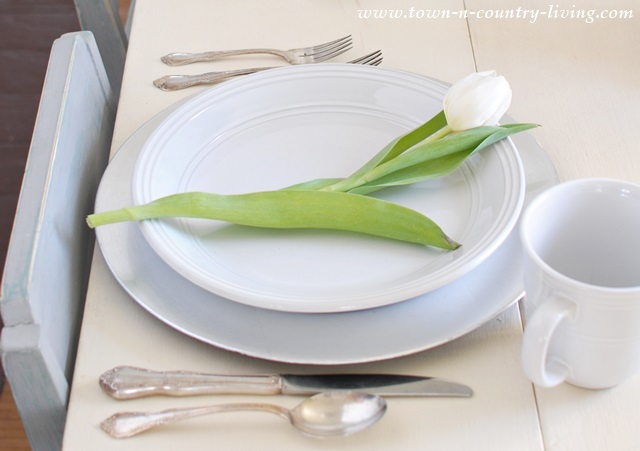 A single stem at a place setting makes a pretty statement on any table. 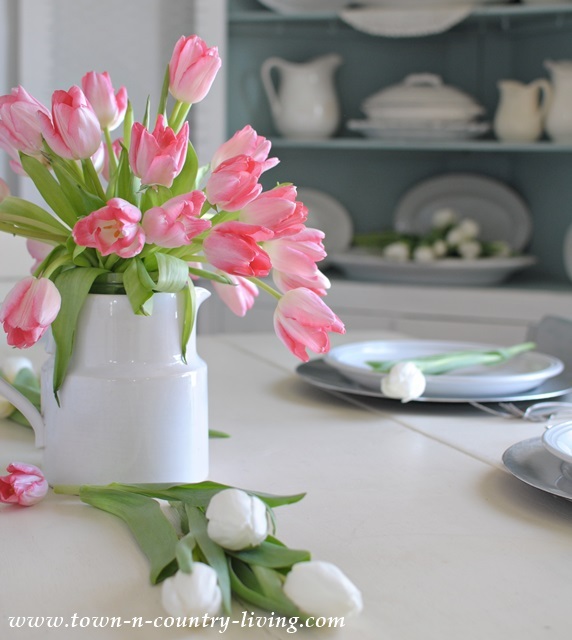 Might as well grace the dining hutch with some white tulips while we’re at it. 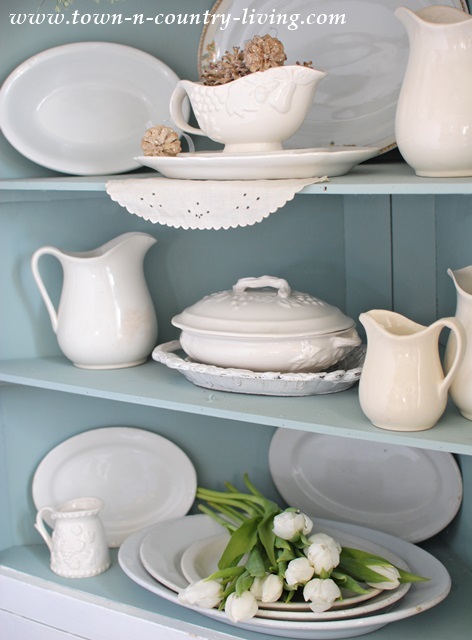 Of course, these were added to a white ironstone pitcher after the photos were taken. And since today is New Year’s Day, I’ll be watching the Rose Parade. My grandmother and I used to watch it whenever I was at her house on January 1st. After the Rose Parade is over, the family is all coming over for lasagna and gelato! Wishing You and Yours a Happy and Safe New Year!! Tulips are my favs. Yours are just gorgeous. Happy New Year Jennifer. Yum dinner sounds so good. Love tulips especially the real ones. I pinned these they are so pretty in that iron pitcher. 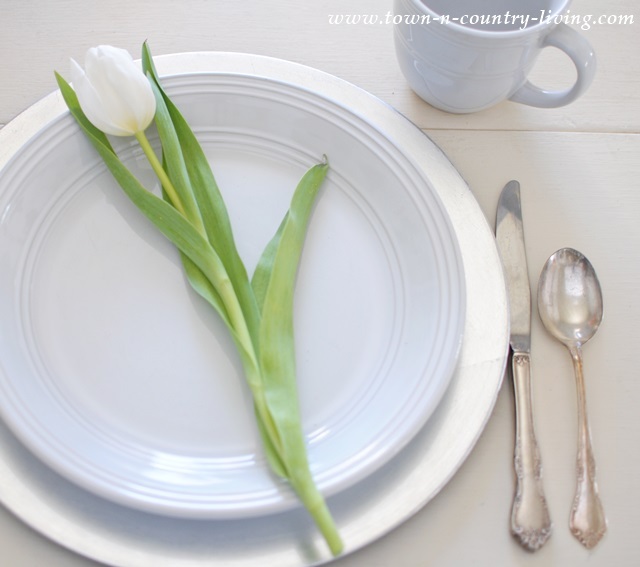 When arranging tulips, add 4-6 pennies to the bottom and your tulips will STAND not go limp. Don’t ask me how or why. You can use the pennies once or twice then this magic will NOT work. Guess it is something on the outside of the pennies. Keep the fresh flowers coming. Great tip, Nan! Thanks for sharing that! Beautiful and I was surprised when I seen the tulips I had no idea they were out anywhere this time of year. So pretty! 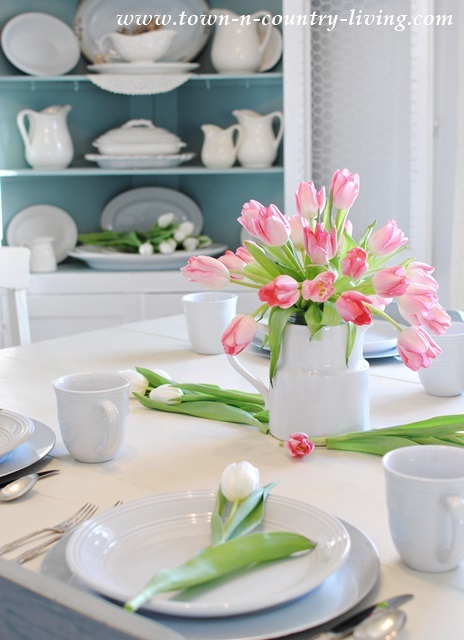 I love the pink tulips against the white dishes. Thank you for sharing these bright and fresh photos. Happy New Year! Beautiful, Jennifer! I always say the very first thing I’d do after winning the lottery is have huge beautiful bouquets of flowers delivered for every room of the house! Every single day! Beautiful! I love fresh flowers in our home too. I don’t have them near as much as I would like. I would live to have a new fresh arrangement each week. My favorite flower is Hydreangea, but my second is tulips. They are so simple, and vyet so elegant! Thanks for sharing your beautiful tulips. Happy New Year Jennifer. Thanks for sharing your lovely photographs with us. I love tulips too and have planted pots of them for this spring. So pretty. I love having fresh flowers in the house. That is one thing on my shopping list today. I like to arrange baskets with potted tulip bulbs and ivy or another filler, so that I can plant them outside when they are finished blooming this year. They definitely brighten the cold wintery days. Happy New Year Jennifer. So lovely Jennifer! 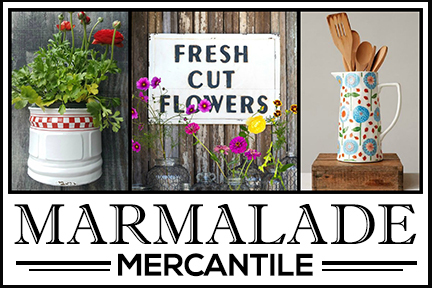 I love fresh flowers too and hope to use some soon in a tablescape! These tulips are gorgeous, Jennifer! Thanks for the tips and also for the referral back to your post on flower arranging. Happy New Year! Tulips are for sure my favorite. I love the penny idea. But when you put in water, make it as cold as possible. 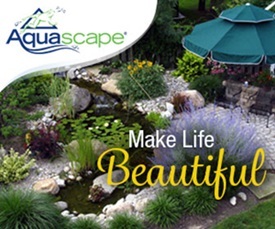 If they start to droop too much, refresh water with cold water. Like splashing cold water on your face, wakes you up!! Absolutely lovely photos, Jennifer. I love tulips. When I see them I always think spring. I carried them on my wedding day so they are a favorite for lots of reasons. I am a food blogger, but I stopped by just for the flowers, and to wish you a happy, healthy, new year. 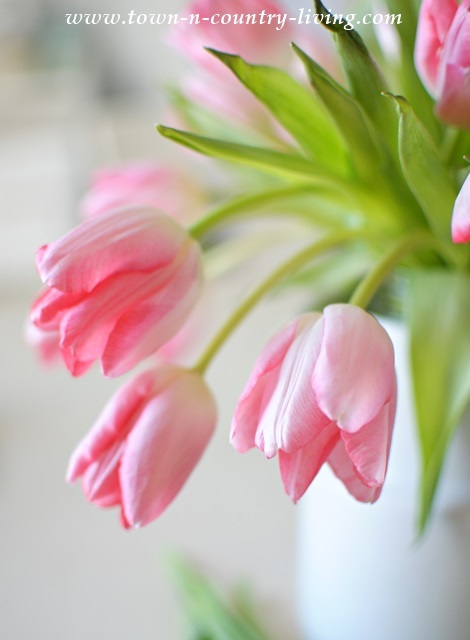 Tulips are my favorite Jennifer…your photos are stunning!! 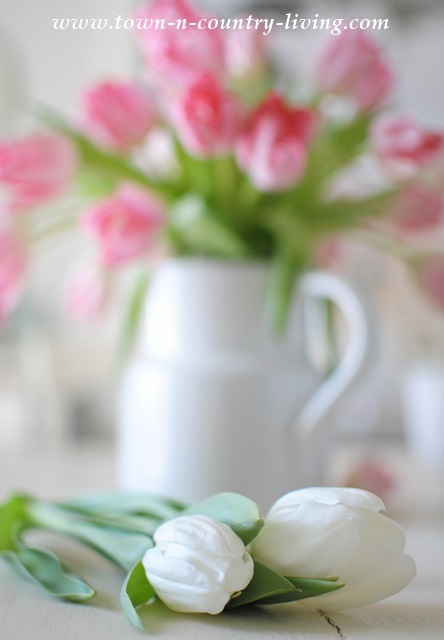 Beautiful, gorgeous photos and tulips. So simple and yet absolutely stunning! What a beautiful post. Those tulips are gorgeous. And your photos are magnificent. Oh, this is nourishment for my soul. The pink tulips are gorgeous! 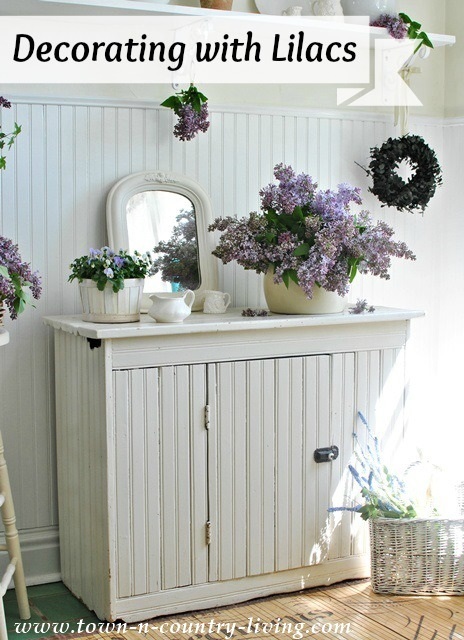 I agree, fresh flowers in our homes are a must. They are hyacinths that feed our souls.